When the Michelin people gave one of their revered stars to a Bangkok street food kitchen, the proponents of Thai cuisine celebrated long and hard with bottles of Leo, Singha and Chang in front of the local 7-Eleven. But not a bottle of Bolly to be seen anywhere. Historically it has been the restaurant that gets the star, but now inexorably linked to its chef. 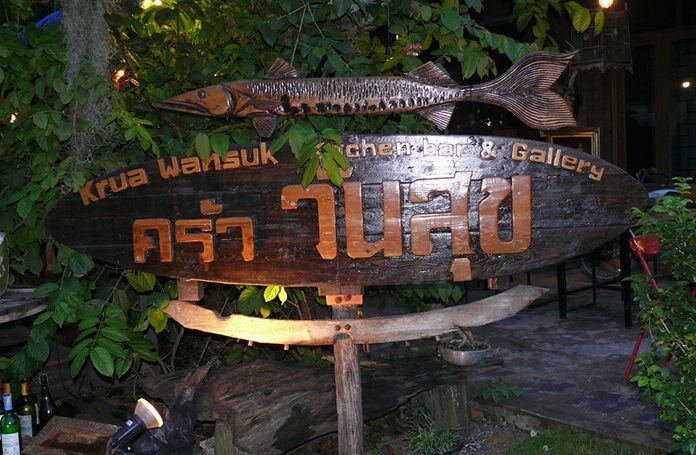 This week we went to Krua Wan Suk, an amazing restaurant tucked away in East Pattaya. Finding it will use your navigation skills, but coming from Mitkamol (“Chicken intersection”) and heading towards the market on Nong Prue Road, you will come to the nasty intersection with Chaiyapornwitee Soi 21. Cross over and follow the road, looking for the signs featuring a fish (a mackerel I am led to believe). About 50 meters from the intersection turn right into Soi 2, go past PMC house then left with a large fish sign for Krua Wan Sook and the restaurant is about 200 meters up on your right. 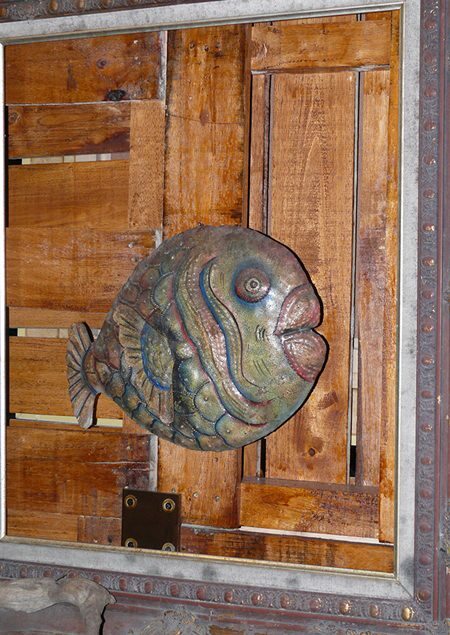 The restaurant is quite large and has been in operation for six months, and does indeed have a kitchen, bar and gallery as its sign proclaims. However, it would probably be better to say it is an eclectic wooden work in progress. The toilets are worth exploring just to see the hand washing basin. Tables are spread out through the garden area and you are certainly not being assaulted by noise. Quirky might be a good description. It is run by family members which also explains why the cuisine is not the usual Thai kitchen/roadside eatery. Fish larb presented in bamboo. 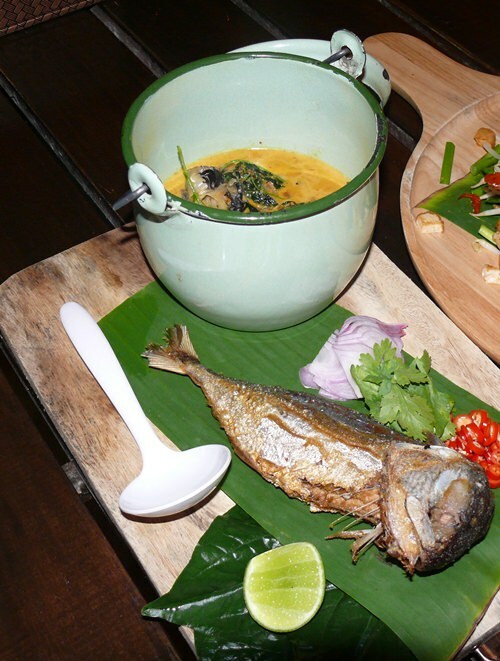 The menu is large and bilingual (Thai and English) but has a number of very different dishes many of which I have never seen (nor tasted) before, such as a fish omelet or mackerel in Thai curry with the curry served separately in its own jug with the cooked fish beside it. The menu shows that the prices are very reasonable with snacks B. 80-150, stir fries B. 120, spicy stir fries B. 170-200, steamed fish in chili paste B. 150-170, lamb in massaman B.180, then there are many specialties with sizzling NZ lamb and sizzling grouper top of the list, the fish omelet, Pad Thai B. 50-180, and noodles marinated overnight in tamarind. This is a different cuisine and I would recommend taking a Thai national with you who can help with explanations. The food does tend to be spicy, but with the kitchen within reach, the chef can make to your taste. 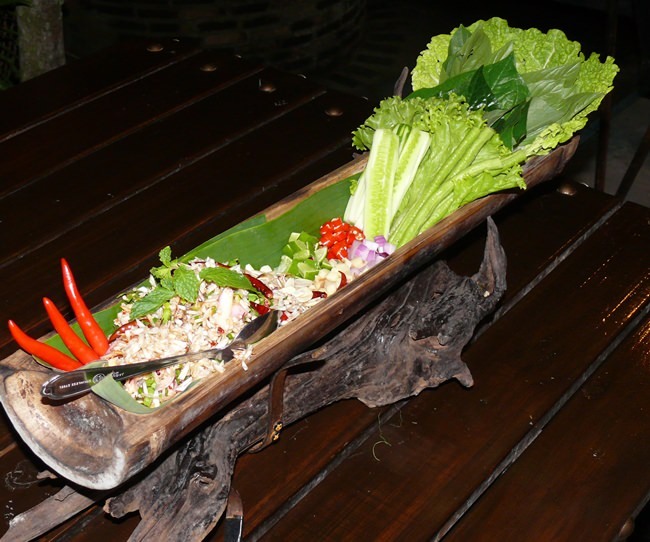 The presentation of the dishes is excellent with the Fish Larb served in a bamboo log along with the chopped chili, onion, lemon and almonds which you wrap in mulberry leaves. Amazing! The River Prawn Pad Thai comes with three little portions of sugar and dried chili (extremely spicy). We tried several of the dishes and Krua Wan Suk gave us consistent quality and this is one different Thai restaurant you should visit. Michelin? Definitely one Star. Do go! Krua Wan Suk, open 7 days, hours 4 p.m. to 11.30 p.m. on street parking, telephone 095 745 6756 (K. Sakda). 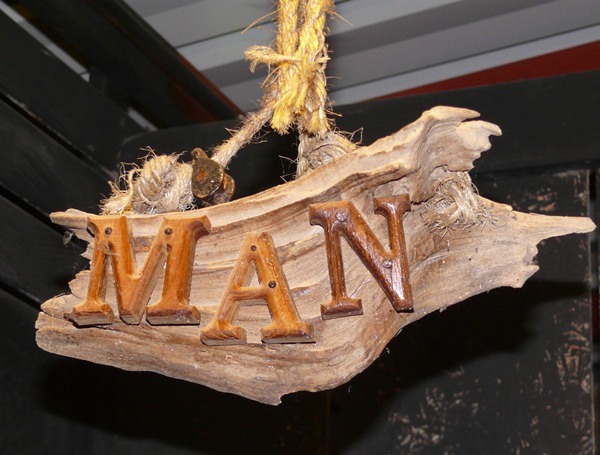 Yes, you’ve found the gentlemen’s toilet.